I was trying to remember the other night what M and I ate in those early years of marriage, but I couldn’t really remember much about those dinners. I do remember we ate a lot of Joanie’s pizza, but mostly because they never looked at us too strangely when we brought in our toothbrushes with us. What? You don’t remember that story? You must be new to these parts. I’m pretty sure we made a lot of pasta that we topped with various sauces from a jar. We defrosted frozen garden burgers, we ate Trader Joe’s Indian dishes – the ones in the foil packets, and served them with their frozen Biryani rice and garlic naan. 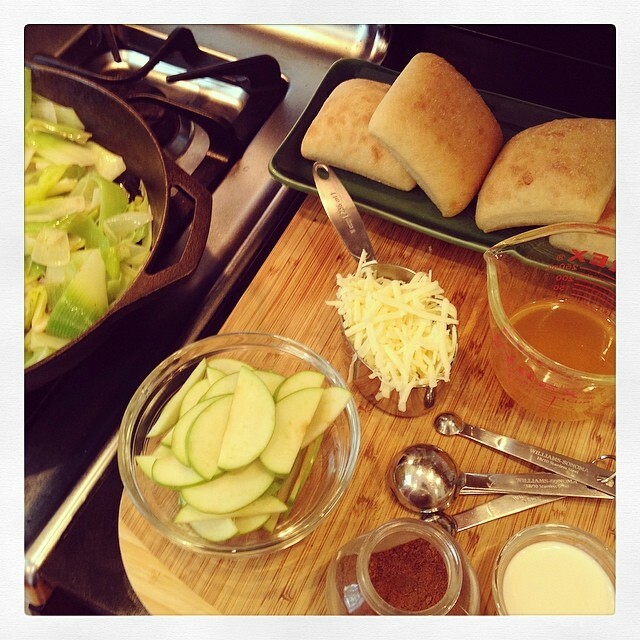 And we made a lot of tacos – canned black beans and canned corn and Lipton Spanish rice – and we still do, occasionally. I’m sure we ate a lot of Bread Co. (Panera to you outsiders), and lots of ice cream, and I know we didn’t starve, or really even complain. But somewhere along the way we got a little bored. I realized that I really, really enjoyed baking, and the things I made weren’t half bad. I started reading more things related to cooking – cookbooks, yes, but also blogs about food written by people with beautiful voices. Without even realizing it, most of those things I read and enjoyed the most revolved around eating, and usually eating a plant based diet. I didn’t make a single ounce of baby food for my first daughter – not one single bit. Not because I didn’t want to, but because why would I? They sold perfectly good stuff in a jar. It honestly didn’t even occur to me over a decade ago, and as she got older, she got pickier, and we stuck to the few things we knew, and we knew she would eat. By the time the second one came around, I was completely tired of dinner – like done with it. 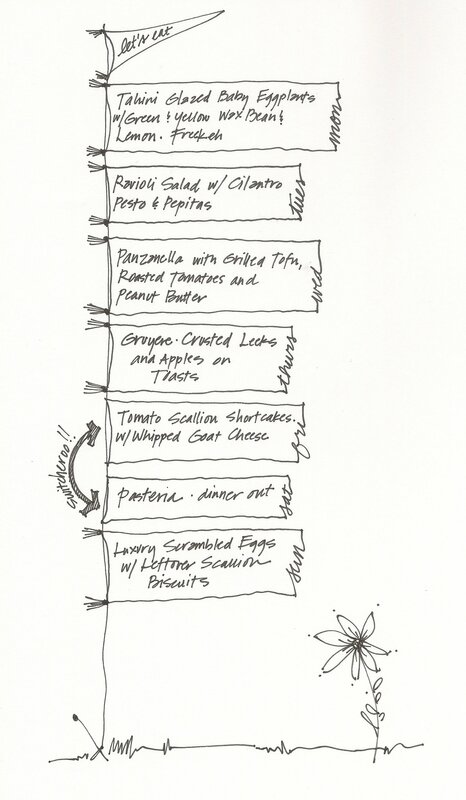 It was a meal to get through and move on from, and everything tasted flat. We ate out a lot – which was easily justified because E was the easiest child ever in public (so shy she never wanted to call attention to herself) and easily justified because we never at fast food – so it had to be healthy, right? Something shifted when the little one was born – she wasn’t quite as easy to venture out with or linger over a restaurant dinner with, and at home I just couldn’t keep making the same old thing. E was in elementary school then, and she was cooking and eating real food every day there. I don’t know what clicked, but something did. It was time to get into the kitchen, and get serious about it. I had a stack of cookbooks that I bought mostly for the photographs and the stories – there wasn’t anything keeping me from actually making something from those pages. I started with the baby’s food (food that she devoured gustily like a supremely appreciative miniature foodie), and that vote of confidence was enough to keep me going, enough to make me sit down at the kitchen table once a week, flip through a stack of books and make a list, enough to slowly but surely train me to walk in the door from a long day of work and flip the oven on, cutting board out, knife at the ready. There were other little nudges along the way – like our obsession with America’s Test Kitchen on PBS – one of two channels we could tune in on our TV, and our slow but steady collection of Cooks Illustrated tested kitchen gear. I could probably make a strong case for my chef’s knife tipping me over the edge, making the act of chop-chop-chopping a pleasure and not an impediment to cooking. But I have to give true credit where credit is due. The first family foodie. And since my prologue was so long, I’ll try for a more succinct second half. Monday night I made the last of the three Blue Apron meals from last week. 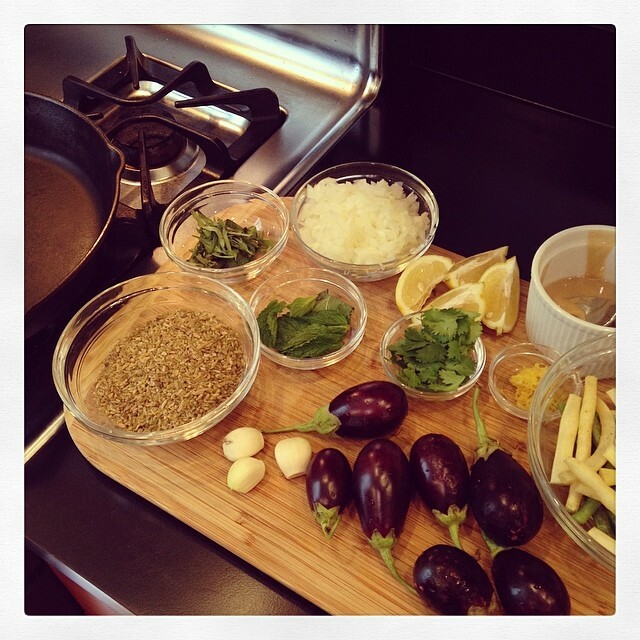 Tahini Glazed Baby Eggplants with Green and Yellow Wax Bean and Lemon-Freekeh. I loved this dish, and had leftovers for two more days. M liked it okay, although he’s not a huge eggplant fan – but these weren’t huge – they were babies. So cute. But the real star of the show was the lemony freekeh, a grain I knew nothing about before last week. Tuesday night I had a meeting, so dinner was a quick affair – a repeat favorite, Ravioli Salad from Super Natural Every Day (it’s linked here in this sampler menu). 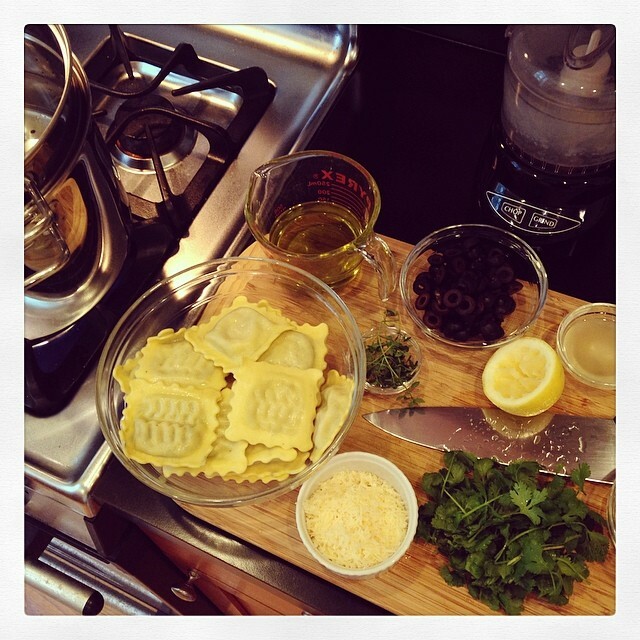 It comes together really fast, and ravioli takes just a couple of minutes to cook. This is a cilantro pesto which has a really nice bite, and is delicious with black olives and pepitas on top – if you can stop the kids from swiping them all. Super filling and delicious. 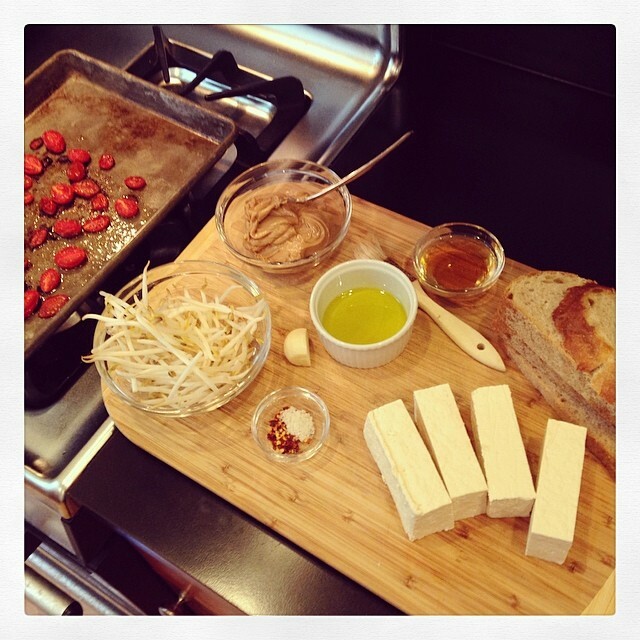 Wednesday I thought I’d try an untried recipe in the same cookbook – Panzanella with Grilled Tofu, Sprouts, Oven Roasted Tomatoes and Peanut Butter. Don’t laugh, it was delicious, and the leftovers were taken before I got down to the fridge the next morning. Thursday I had Gruyere Roasted Leeks with Apples on the menu (from Ripe), and since I knew this would be a good one, and good for me, I summoned up the energy to put it together. Thursday was a rough one – I haven’t felt that bad in a long time (surgery excluded). The girls aren’t huge leek fans, but the oldest was out of town all week, and the youngest was happy eating the apples and cheese over the toast I served with it. Friday night we changed plans last minute and met up for dinner out at Pasteria, just the three of us. Only one ate gelato, which is sort of a crime there, but after half my pasta bowl I was done. Leftovers were delicious for Saturday lunch. Saturday night I made the recipe that graces the cover of the Smitten Kitchen Cookbook – as soon as I saw the quarts of multi-colored cherry tomatoes at the farmers market that morning I knew what we were having. 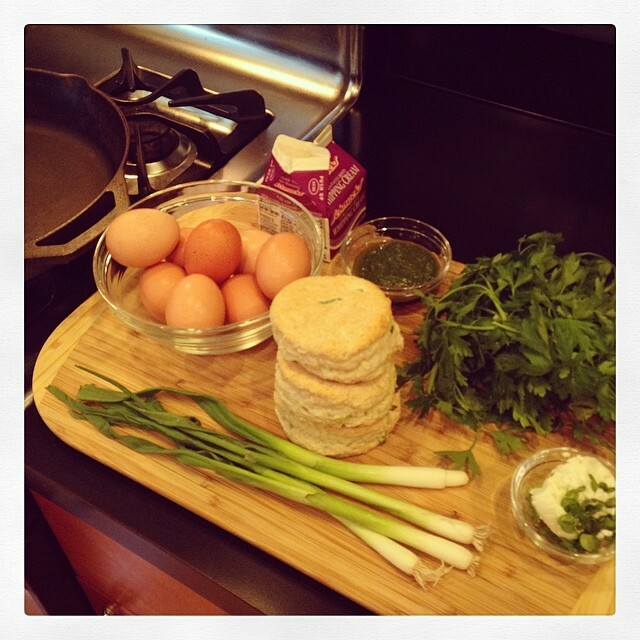 The scallion shortcakes are really more like biscuits, and take about 25 minutes from start to finish. 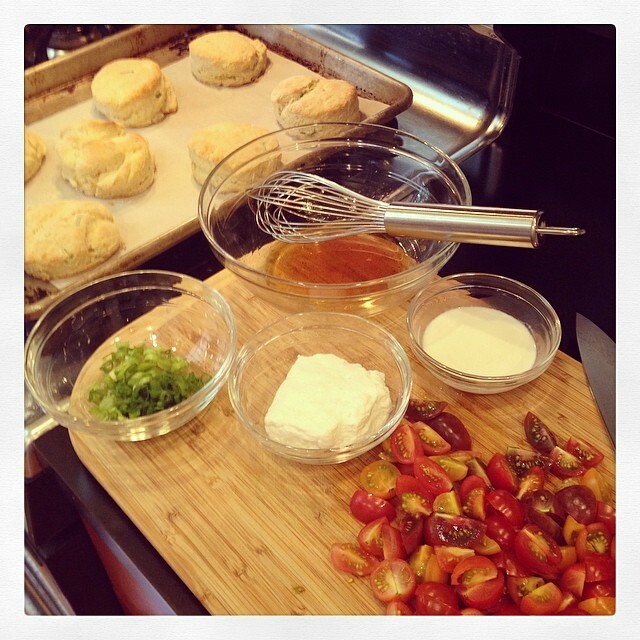 The tomatoes in dressing and the whipped goat cheese from the market as well come together during the 15 minutes of biscuit baking time, and so dinner’s on the table in half an hour, and looks good doing it. M headed out to Dallas Sunday morning, and I picked up E Sunday afternoon. At 7:3o that evening I was faced with our dinner prospects. The Splendid Table’s Luxury Eggs came to the rescue, and I swirled everything creamy and greenish in the fridge into the eggs, and everyone ate them without comment. Just as Sunday supper should be.